In ceramic testing this term generally refers to the pore space within a fired clay body. It is measured by weighing a specimen, boiling it in water, weighing it again, and calculating the increase in weight (thus it is also known by the term absorption). 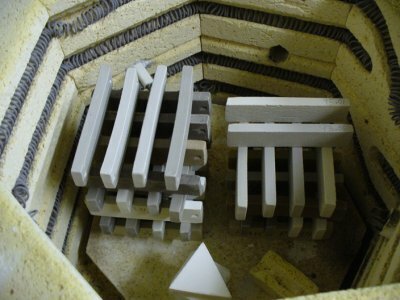 As ceramic clay bodies vitrify in a kiln they densify and shrink (thus reducing pore space). The % porosity of a body is thus an indicator of its degree of vitrification. Porosity also implies strength (in comparison to specimens fired at different temperatures that have greater or lesser porosities). Porcelains normally can be fired to a point where no porosity can be measured (termed zero-porosity). Typically, continuing to fire higher brings ware closer to melting and therefore much more likely to warp out of shape. Stonewares and earthenwares having coarser particles in the body usually reach a minimum porosity that can be well above zero (as much as 3%), firing beyond that bloats or melts the body. It is thus important to fire your clay body across a range of temperatures below and above what you work at to get a complete picture of its density as it relates to firing temperature. Developing an efficient way to make, fire, measure, boil and weigh test bars is a key to being able to do this. You can use an account at insight-live.com to learn how to do this and log and report your results. When porosities are measured over a range of temperatures for a body it is possible to create a graph to get a visual representation of the body's maturing range. The porosities plotted against temperature produce a line that decreases to a minimum, levels out then typically rises quickly. Some bodies have a fairly broad temperature range at which porosity remains zero, for others it is quite narrow. 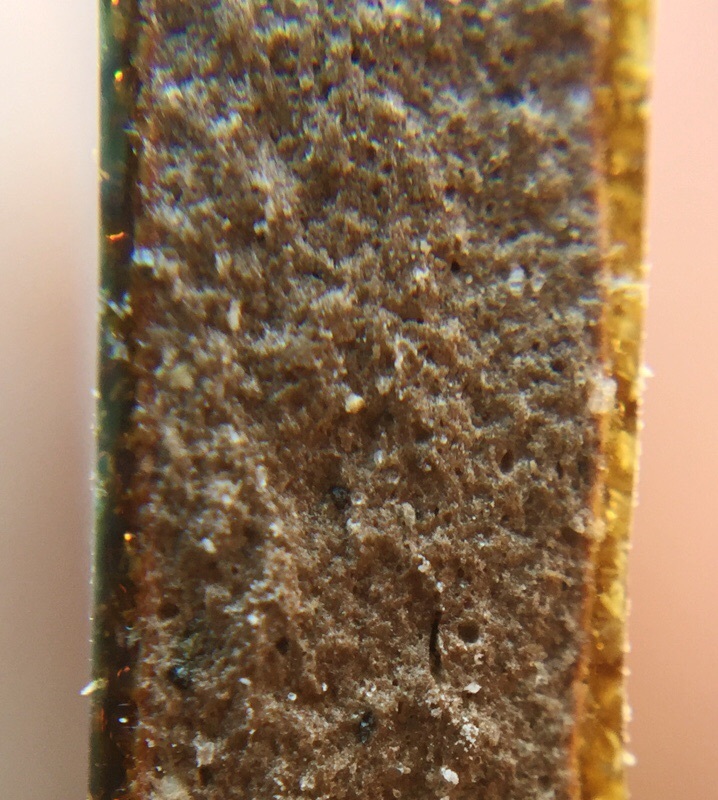 The terra cotta (red earthenware) body on the upper left is melting, it is way past zero porosity, past vitrified. The red one below it and third one down on the right have 1% porosity (like a stoneware), they are still fairly stable at cone 2. The two at the bottom have higher iron contents and are also 1% porosity. By contrast the buff and white bodies have 10%+ porosities. Terra cotta bodies do not just have high iron content to fire them red, they also have high flux content (e.g. sodium and potassium bearing minerals) that vitrifies them at low temperatures. White burning bodies are white because they are more pure (not only lacking the iron but also the fluxes). The upper right? Barnard slip. 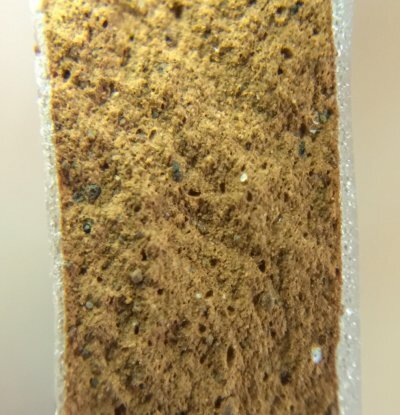 It has really high iron but has less fluxes than the terra cottas (having about 3% porosity). A body so porous that it has absorbed its own glaze! This unbelievable body is made from dolomite, 65% of it. There is 35% ball clay to give it workability and 5% Ferro frit 3110. The frit stabilizes it so that the fired body does not rehydrate. This has a porosity of 35%! And that porosity is stable across the entire range we have fired it at (cone 06-6). The single-layer on the lower portion has been completely absorbed, the double-layer on the upper is almost gone. 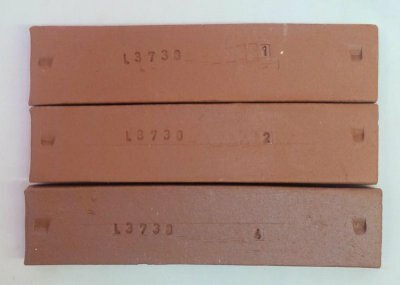 A very fine particled low fire red burning terra cotta clay (Plainsman Redearth) fired at cone 2,3 and 4 (top to bottom). Notice the cone 4 bar is beginning the melting process (signaled by the fact that it is expanding). Yet it is not bloating as this type of raw clay normally would. The cone 2 and three bars have reached zero porosity also. 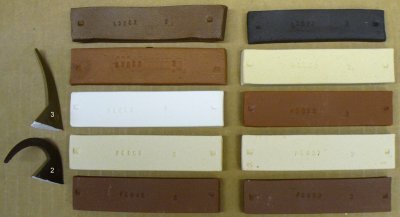 Other clays that fire to very similar color begin to bloat long before they reach zero porosity. The glaze is well melted, but the interfacial zone with the body is very narrow. It is basically just stuck on the surface. 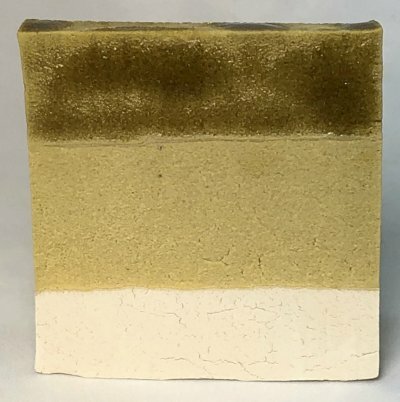 The body is not developing any clearly visible glassy phases as does porcelain and stoneware, so not surprisingly, its strength is much lower than vitrified clay bodies at higher temperatures. However it is possible to add a frit and glass-bond the particles at cone 02 (at much higher cost of course). Not surprisingly, glazes must be more closely tuned to match the thermal expansion of the body for lower temperatures (since they are not stuck on as well). These have already been measured to deduce drying shrinkage. After firing they will be measured again to calculate the firing shrinkage. Then they will be weighed, boiled in water and weighed again to determine the water absorption. Fired shrinkage and absorption are good indicators of body maturity. It seems impossible but that is what happens with this one at cone 03. This is a native material that was found on the banks of the South Saskatchewan river near Hayes, Alberta (and brought to me for testing). Even when fired to maturity (around cone 2) it still has 10% porosity! This specific sample has even been ball milled for hours and it still does not shrink. And it still feels sandy on the potters wheel. It also has incredible dry strength, the highest I have ever seen. Yet its drying shrinkage is still less than 7% (that of a typical plastic pottery clay). Plus it has very high plasticity. This behavior defies logic, I have found a good explanation. Even after two weeks it is still sticky. This was purchased at an import store. What could this black goo be? It is likely a sealer that they use to make the porous clay water tight, perhaps an organic sugar. The clay is porous (and thus also weak) because they want to save energy by firing their kilns as low as possible. 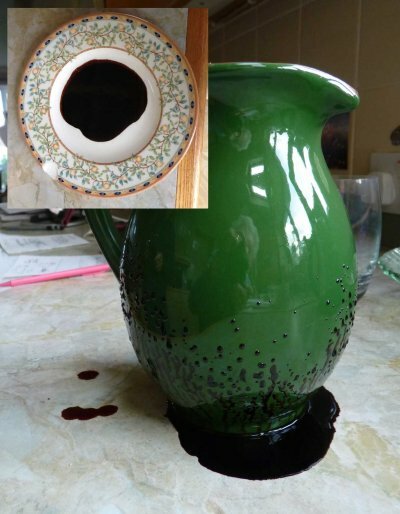 A water soluble sealer can be OK if the vessel is not used for storage. 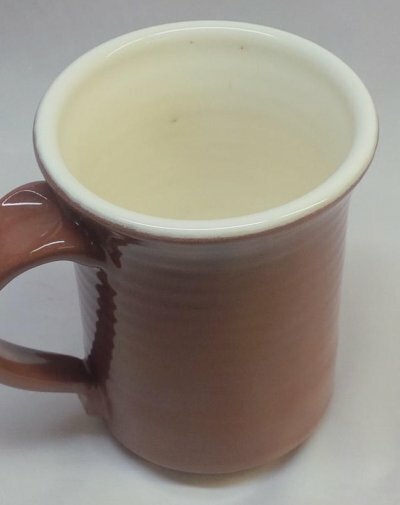 But it is not OK because there is another problem: The glaze is crazed. That is what is permitting the water to be absorbed into the body. That water is dissolving the sealer and bringing it out. 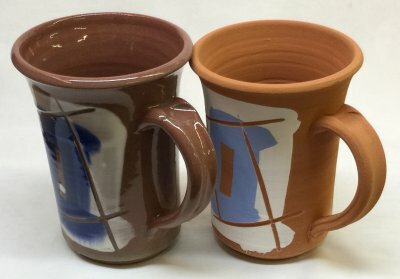 There is yet another issue: The glaze could very well contain lead. Lead makes glazes melt low, so it is a great for saving energy. But not so great for producing safe ware.